News Friedhelm Loh awarded "Honorary Doctorate in Engineering"
24.03.2016. The Technische Universität Chemnitz has awarded the Hessian entrepreneur Friedhelm Loh an honorary doctorate for his outstanding contributions to science and technology. Representatives of research institutions and universities and from the worlds of politics, industry and trade associations honoured the industrialist as a resolute man of action and visionary. Friedhelm Loh is a driving force behind the networking of business and science, is actively helping to shape industrial digitalisation, and is thus inspiring future generations to think in new ways and to act responsibly. His success is based on creative curiosity, hard and inventive work, his passion as an entrepreneur and his renouncement of things that others take for granted, that is how Professor Reimund Neugebauer described the newly designated Doctor Friedhelm Loh to a large audience in the ballroom of the Technische Universität (TU) Chemnitz. The President of the Fraunhofer-Gesellschaft and holder of the Chair of Machine Tool Design and Metal Forming stressed that Friedhelm Loh always achieved his goals, generating enthusiasm and displaying responsibility and humanity in the process. 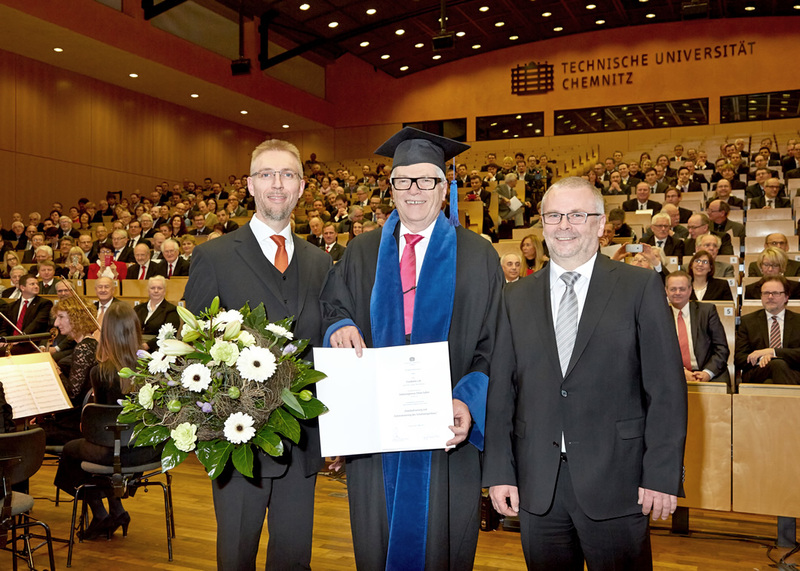 The Technische Universität Chemnitz was happily awarding the Hessian entrepreneur the honorary doctorate for his active work in networking industry and science, business and academia. His work had set priorities and opened up new horizons. The globally established Friedhelm Loh Group with its 11,500 employees has been cooperating with the University since 2014 and has endowed a professorship. The research-intensive endowed chair in System Technology and Switching Modules at the Department of Lightweight Structures and Polymer Technology consults closely with the company. New technological findings are being assimilated into teaching at the University. Findings from the research are made available to the company. Science and industry were dependent on each other more than ever before, Professor Schubert added. In his speech, Professor Dr. Stephan Holthaus, rector of the Giessen School of Theology, explained why it pays to be driven by Christian values: “What has mechanical engineering got to do with prayer, and what do have switching modules in common with moral values?”, he asked the audience. In his reply, he recalled the founding of the Benedictine order in the sixth century. Its rules, including “Ora et labora – pray and work”, were more relevant today than ever before: “We live in a time when the meaning of work is overstressed. He added that work nowadays was not embedded within a larger horizon of meaning.” What are needed are moral rules and ethical guidelines, which Friedhelm Loh and his family exem-plify. Loh was a “hard worker of the old school, who is determined and works hard, who is willing to accept responsibility and does not make it easy for himself,” said Dr. Holthaus: “This is admirable in an era that yearns for values and orientation.” Dr. Holthaus not only outlined Loh’s economic success but also focused on how it was firmly rooted in the Christian faith: “You adhere, in word and deed, to the rules laid down Saint Benedict,” he said in praise of the prize-winner. The art of science is to develop solutions for the benefit and protection of the people, Friedhelm Loh added. He emphasised the fact that science and industry also bore responsibility: “Industry 4.0 is the technology that is developing itself, gaining new insights from its own data and so changing our lives. Despite all the euphoria about self-organising technologies, one ought not underesti-mate the dangers of cybercrime or of humans becoming ‘transparent’: There is a great danger that we will not only to lose the freedom anchored in our constitution but also the right to well-being, to hold our own opinions, and to act individually.” He feared that the personal right of liberal individuality would perish though the access of technology to human beings: “Data not only creates free spaces but also prisons.” In terms of their responsibility before God and Man, science, industry, government and justice are required and obliged to protect human dignity. Rector Andreas Schubert summarised the recognition of all those present for the new Honorary Doctor of Engineering with a quote from Oscar Wilde – "It is personalities, not principles that move the age." 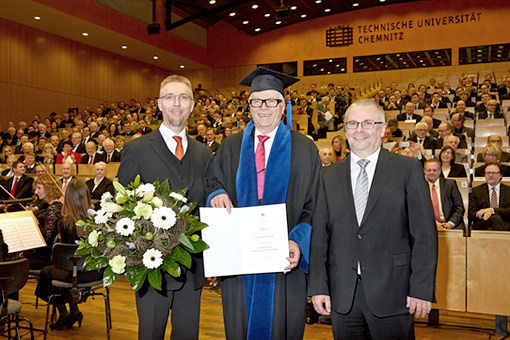 Image: Professor Thomas Lampke (left), Vice Dean for Research, International Affairs and Equality at the Department of Mechanical Engineering, and Professor Andreas Schubert (right), Acting Rector of the TU Chemnitz, respectfully awarded Friedhelm Loh his honorary doctorate before a well-filled auditorium.